French cookie recipes are quite varied and some of them are fairly easy to make. The French don't have a lot of bar or drop cookies, but they do have some of their own tasty innovations. Petit Gateau - This means little cake and might be used by the French to refer to just about any sort of cookie. Biscuit - Any cookie that is dry and crispy gets called a biscuit. To confuse things, biscuits are sometimes called petits gateaux secs or little dry cakes. And for even more confusion, there are some cakes that get called biscuits, such as a biscuit genoise. Cookies - The French use this American word when referring to a very specific thing: chocolate chip cookies. Rochers coco couldn't be simpler to make - just an egg white cookie with lots of coconut flavor and texture. More cake like than a cookie, these are usually baked in a brick shape, said to resemble a bar of gold and giving this French treat its name. Another cookie that is really more of a small cake. 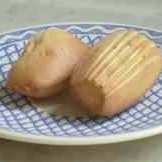 Madeleines are popular at tea or snack time in France. You might find a huge version of these for sale in a French pastry shop. A good meringue is crispy on the outside with just the right amount of creamy give in the center. These are made with orange flower water and are made to resemble little boats. These might be served with cream or mascarpone cheese. More Recipes Soon to Come . . . These are bite sized puffs made from choux pastry dough and decorated with large sugar crystals. These cookies actually originated in Florence, but they are very popular in France. A mixture of caramel, candied fruits and nuts is dipped or drizzled in chocolate. These crispy sugar cookies are said to resemble a cat's tongue and are typically served with ice cream or another dessert. A sort of meringue sandwich cookie that gets made in every flavor and color imaginable. I even saw Camembert cheese macarons the other day! A traditional shortbread cookie recipe from Bretagne - these are shaped like a hockey puck. Puff pastry is rolled with sugar then sliced into a sort of heart shape before being baked crisp. This is another French cookie recipe that goes great with other desserts. The classic French butter cookie, sablés take on any number of shapes and flavorings to be transformed into the perfect treat for any occasion. Almond tuiles are a little tricky to make - you have to work fast to get the correct shape - like a Pringle.